Posted April 9th, 2009 by BUTCH Voices. The mission of BUTCH Voices is to enhance and sustain the well-being of all individuals who are Masculine of Center. * We achieve this by providing programs that build community, positive visibility and empower us to advocate for our whole selves inclusive of and beyond our gender identity and sexual orientation. Our community is vast and growing and we have many identifications that resemble what the world knows as our “butchness.” We recognize our diversity as having a foundation rooted in butch heritage. We welcome the on-going development of movements intentionally and critically inclusive of our gender variant community. 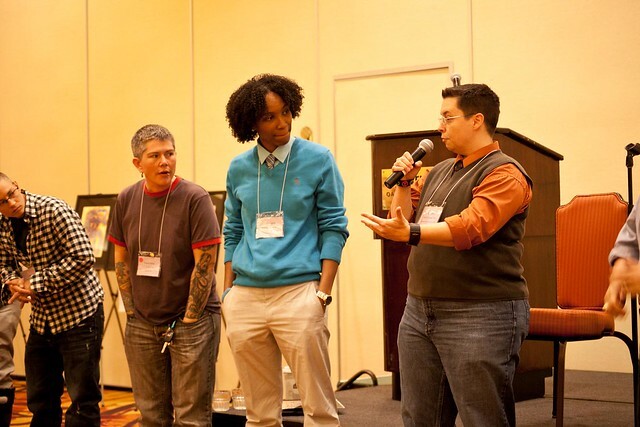 BUTCH Voices is a social justice organization that is race and gender inclusive, pro-womanist and feminist. BUTCH Voices is a grassroots organization dedicated to all self-identified Masculine of Center* people and our Allies. We, at BUTCH Voices, feel it is important to bring together our diverse communities, build bridges, make connections. We use our collective voices to gain better understanding of each other and promote positive visibility with intention, integrity and transparency. *Masculine of center (MoC) is a term, coined by B. Cole of the Brown Boi Project, that recognizes the breadth and depth of identity for lesbian/queer/ womyn who tilt toward the masculine side of the gender scale and includes a wide range of identities such as butch, stud, aggressive/AG, dom, macha, tomboi, trans-masculine etc.